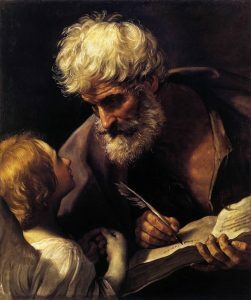 Since it is the Feast Day of St. Matthew, let’s learn a lot about him. If looks could kill, he’d be dead. The Jews glared at Levi as he counted his coins. Tax collectors in Israel had great wealth and were considered renegades and traitors. 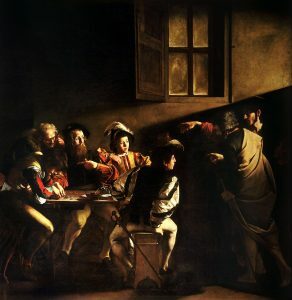 Levi, a Galilean Jew who was also called Matthew, would soon be despised for more than confiscating money from his own people. He would be an outcast for following Jesus. One day Matthew, son of Alphaeus (Mk 2:14), was sitting at his booth collecting taxes for Rome and a young rabbi named Jesus walked by and “saw a tax collector, named Levi, sitting at the tax office; and he said to him, ‘Follow me.’ And he left everything, and rose and followed him” (Lk 5:27-29; cp. Mt 9:9). 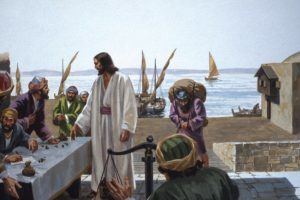 After leaving his tax booth, Matthew prepared a great feast for Jesus in his home and invited a great company of tax collectors and others to sit at table with Jesus. When you open the New Testament, the first book you find is the Gospel of St. Matthew. How do we know Matthew wrote the first Gospel? We know because of Catholic tradition. Whereas the rest of the New Testament books were written in Greek, Matthew’s Gospel was originally written in the language of the Jews and only later translated into Greek. Papias (c. ad 60-130), a living witness to the teachings of the apostles wrote, “So then Matthew wrote the oracles [of the Lord] in the Hebrew language” (Eusebius, History of the Church, 3, 29). St. Irenaeus (c. 130-200) wrote “Matthew also issued a written Gospel among the Hebrews in their own dialect, while Peter and Paul were preaching at Rome” (Against Heresies 3, 1, 1). Matthew preached the Gospel orally long before committing the Saying of the Lord to writing sometime between AD 40—70. No date is certain and debate has raged with some wishing a later date. Tradition informs that Matthew preached to the Jews in Palestine for over a decade and later went to foreign nations including Ethiopia, Macedonia, Syria, Persia, Parthia and Medea. Matthew was a Jew writing to Jews. By some calculations, he quotes directly or alludes to the Old Testament a whopping sixty-five times! Readers today must “think” and read like his original audience—Palestinian Jews—to get the full impact of his message. Mark preaches Jesus to the Romans as a servant with no genealogy; Luke portrays Jesus as humanity to the Greeks with a genealogy going back to Adam; John tells the world Jesus is divine and as God he has no genealogy. Matthew, however, adeptly presents Jesus to his people as Messiah and King with royal pedigree through the kings to David and back to Abraham the patriarch of Israel. The phrases Kingdom of God or heaven are used almost forty times. Using the interpretive techniques of the contemporary teachers of the Law, Matthew skillfully handles the Tanakh arguing that Jesus is the Coming One promised by Moses and the Prophets. Jesus was a master storyteller, teaching the kingdom of heaven through parables. Matthew weaves these grandly simple stories and miracles into his Gospel to pull back the curtain on the supernatural revealing Jesus’ true identity. Jesus walks through the pages adorned in the purple and gold of royalty. Chapters 1-4 narrate King Jesus’ ancestry, virgin birth, commission, and the inception of his public ministry. Chapter 5 opens with Jesus as the New Moses. With imagery alluding to Mount Sinai, we read, “he went up on the mountain, and when he sat down his disciples came to him. And he opened his mouth and taught them” (Mt 6:1-2). Over fourteen hundred years earlier God had spoken through Moses: “I will raise up for them a prophet like you from among their brethren; and I will put my words in his mouth, and he shall speak to them all that I command him” (Deut 18:18). As Jesus took his seat on “the mountain”, the Sermon on the Mount (chapters 5-7) established him as the Prophet who would fulfill and re-define the Law of Moses (Mt 17-22), revealing the interior nature of the Kingdom of God as opposed to the exterior legalism of the Pharisees. To read the rest of my article on St. Matthew, click here. Next post: Why Are We Catholic?